MSM (Methylsulfonylmethane) is a basic element essential to many structures and functions of the human body, especially the joints, cartilage, and tendons. MSM also plays a role in supporting healthy levels of collagen and keratin, which are important substances in healthy looking skin. MSM (Methylsulfonylmethane) is a basic element essential to many structures and functions of the human body, especially the joints, cartilage, and tendons. MSM also plays a role in supporting healthy levels of collagen and keratin, which are important substances in healthy looking skin. Life-Flo’s maximum strength natural MSM Plus Cream contains 15% MSM. 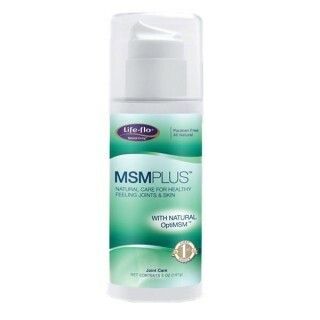 MSM plays a major role in skin care and may promote smoother, firmer looking skin. It is also an excellent skin softener with anti-wrinkle properties when combined with dipalmitoyl hydroyproline – a new generation natural compound derived from grafting a fatty acid with an amino acid. 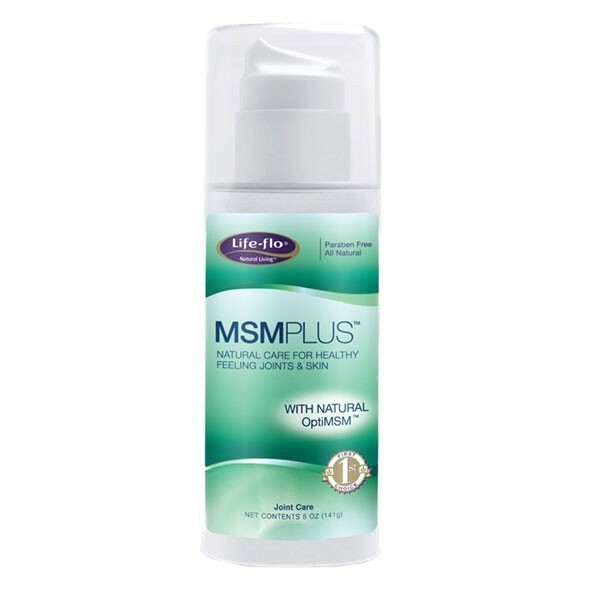 MSM Plus combines MSM and Dipalmitoyl Hydroxyproline, a lipo amino acid which is naturally present in the skin, in a cream. Dipalmitoyl Hydroxyproline supports the growth and contraction of the collagen fiber network of the skin. The result may be flexible, firmer, younger-looking skin. MSM is a naturally occurring, dietary sulfur compound found in all living things. Sulfur is present in every cell in the human body, and is the eighth-most common compound in the body. It makes up about 1% of a person's’ body weight, and is critical to the normal function and structure of the human body. It is a raw material needed for the natural production of protein and connective tissue. 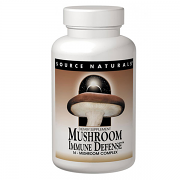 This product is available in a 5 oz. airtight pump container that helps to protect the ingredients from oxidation and ensures the potency of the natural ingredients. Ingredients: Purified Water, Aloe Vera Gel, Methyl Sulfonyl Methane, Olive Leaf Extract, Caprylic/Capric Triglyceride, Dipalmitoyl Hydroxyproline, Evening Primrose (oenothera biennis) Oil, Vitamin E Acetate, Stearic Acid, Flavonoids, Glyceryl Stearate, Shea Butter, Lecithin, Glycerine, Allantoin, Potassium Sorbate, Carbomer, Phenoxyethanol and Caprylyl Glycol, Sodium Bicarbonate, and Grape Seed Extract. Warning: For external use only. Use only as suggested. Avoid contact with eyes. Do not apply directly underneath the eye or on top of the eyelid. If irritation, redness, or discomfort occurs, discontinue use and consult a licensed health-care professional. Keep out of reach of children. Consult a healthcare professional before using this or any product during pregnancy, when nursing, or if you have a serious medical condition.